To coincide with the National Day of the People's Republic of China on 01 October, The Grand Hotel & Spa, York has announced its commitment to becoming the 'most China-friendly hotel in the north of England'. The hotel's plans have been launched on the back of the VisitBritain GREAT China Welcome Charter, which aims to welcome 650,000 Chinese visits a year to the UK by 2020, worth almost £1.1 billion to the UK economy. Philip Bolson, General Manager of The Grand Hotel & Spa, York, said: "We wholeheartedly support VisitBritain's goal to make Britain the most welcoming European destination for the Chinese visitor, so much so that we're going above and beyond to secure our position as the most China-friendly hotel in the north of England. "We have made a commitment both in terms of staff hours, training, and financially to reach our goal. York is an incredible city for tourists, from the historic Minster to the iconic York City Walls quite literally on our doorstep, and we're excited to welcome more visitors from the Far East to our home." Michelle Brown, Marketing Manager for Visit York, said: "China is now one of York's key international markets for tourism and we're committed to helping our hotels and visitor attractions to become 'China Ready'. 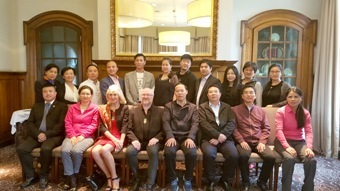 The Grand Hotel & Spa was one of the very first hotels in the city to successfully complete Welcome training for Chinese visitors, helping to deliver the goals of VisitBritain's Great China Welcome programme. We're delighted they are setting the standard for hotels across the North." The 01 October National Day starts a seven-day 'holiday week' celebration in China, allowing people to visit relatives and travel both at home and abroad.